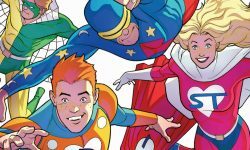 Home Posts tagged "mighty crusaders"
The Blossom family secret erupts in ARCHIE #29! Preview the new Archie Comics releases for 3/21/18! What’s new in the world of Riverdale and beyond? Take a look below at previews of ARCHIE #29, MIGHTY CRUSADERS #4, RIVERDALE DIGEST #7. The road to the Spring Dance begins in ARCHIE #28! Preview the new Archie Comics releases for 2/14/18! What’s new in the world of Riverdale and beyond? Take a look below at previews of ARCHIE #28, MIGHTY CRUSADERS #3, MARVEL COMICS DIGEST #5 AVENGERS WITH BLACK PANTHER, and BEST OF ARCHIE 2017 DIGEST ANNUAL! The Archies meet The Monkees! Preview the new Archie Comics releases for 1/10/18! What’s new in the world of Riverdale and beyond? 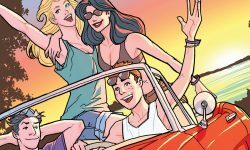 Take a look below at previews of THE ARCHIES #4, ARCHIE #27, MIGHTY CRUSADERS #2, and WORLD OF ARCHIE JUMBO COMICS DIGEST #75! What’s new in the world of Riverdale and beyond? Take a look below at previews of ARCHIE #26, MIGHTY CRUSADERS #1, and B&V FRIENDS WINTER ANNUAL DIGEST #257! The Mighty Crusaders are back! Writer Ian Flynn and artist Kelsey Shannon discuss the new series on the BumbleKast. 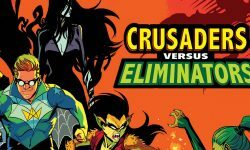 Mighty Crusaders writer Ian Flynn and BumbleKast co-host Kyle Crouse welcome Mighty Crusaders penciller/inker Kelsey Shannon to the latest edition of the BumbleKast! THE SHIELD! JAGUAR! THE COMET! STEEL STERLING! FIREFLY! DARKLING! On December 6th, the mightiest team of superheroes are back! Join writer Ian Flynn (JUGHEAD), artist Kelsey Shannon (JOSIE AND THE PUSSYCATS), colorist Matt Herms and letterer Jack Morelli for high-octane super-hero action with the MIGHTY CRUSADERS #1!